Today’s guest blogger is Jamie Krakover. Growing up with a fascination for space and things that fly, Jamie turned that love into a career as an Aerospace Engineer. Combining her natural enthusiasm for science fiction and her love of reading, she now writes MG/YA sci-fi and fantasy. Check out her blog or follow her on Twitter. And no the rocket science jokes never get old! I love science fiction. Whether it’s books or movies, I love exploring the possibilities of what if. And let’s face it there are a lot of really cool possibilities when it comes to space travel. Unfortunately, a lot of the really awesome things we see in science fiction movies and even books are less than realistic. That’s not to say you can’t stretch the truth and explore options but if you want it to be believable you need to understand some things about space travel. So as writers, how do we decipher reality from Hollywood? How do we create fiction that could be realistic, and that is an extension of our world without making it overdramatized and fake? We research. So in an effort to put my rocket science to good use, and help my fellow writers here are 9 common misconceptions about space travel. In space, up, down, left, right, etc. is all relative. It’s really easy to get disoriented because there is no north or south, forward or backward, it’s just a vast expanse. Without other objects to orient against, it would be hard for someone in space to figure out which way is up. Literally. Because “up” as we know it doesn’t really exist. This is one reason why the quote, “The enemy’s gate is down” from Ender’s Game is so famous. Because in space, “down” is relative to what direction you are facing. Orienting in space isn’t easy. There’s no floor or ceiling, and that’s a difficult thing for the brain to wrap itself around. But by Ender identifying the enemy’s gate as down, this helped him orient within the battle room where they were in a near weightless environment with no frame of reference. Nope not even close! It’s not like cruising around underwater either. I know astronauts train in the water, but that is mainly to help simulate the feeling of “weightlessness”. Astronauts often build and maneuver heavy objects in space so training in water helps simulate a lighter load. 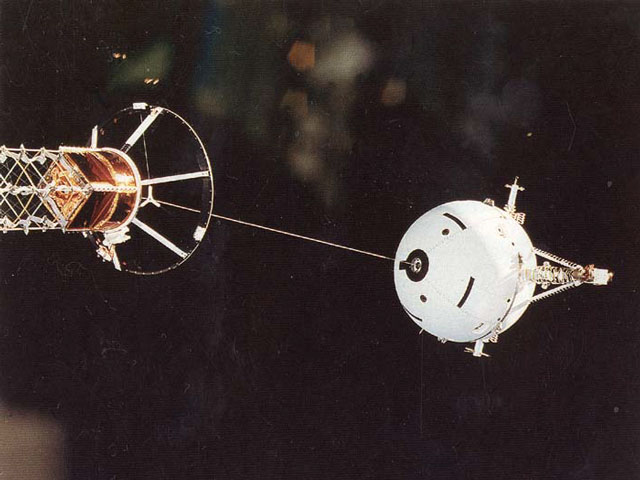 That said, maneuvering in space is extremely difficult. There’s no friction. Not to go all physics on you, but Newton was a smart guy. When he said an object in motion stays in motion until an external force is applied, he meant when you push on something it will keep going forever until something else stops. On Earth a lot of times that something is friction (or a car or a wall or another person etc.). In space, there are very few things to stop objects in motion. If you push something it will presumably go in the direction you pushed it, forever and ever unless it hits something else or enters into the gravitational pull of another object (see #1). In which case the object will then take on a new direction and continue on in that direction until affected by something else. Where it gets tricky is when you factor in that things can go (for lack of better words) up and down, left and right, and front and back. But you can also spin around those directions in what’s called yaw, pitch, and roll. When you combine those directions in different combinations, there’s a lot of different ways an object can move. It can pitch and go down, it can roll and go forward, it could do everything at once. etc. So if you have an object spinning toward a planet through space it’s pretty hard to get it to stop. If it hits something else, it’s likely to be sent spinning off in a completely different direction forever, or until it encounters something else. This is a great video that shows how difficult it is to stabilize a spinning object in space. I love a good science fiction space battle like the next person. Watching spaceships blow up is really cool. Unfortunately it’s REALLY unrealistic. Again space is a vacuum. There’s no air, which means there’s no oxygen in space. Without oxygen, you can’t have fire. And without fire there can be no explosions. I know… so sad, but so true. People don’t blow up in space either. I know I’m ruining all the fun. There may be no pressure in space, but that isn’t what would cause people to explode. If a person were to go out into space without a pressurized suit they would bloat and go unconscious, but from that point they’d probably die from hypoxia or an embolism not from actually exploding. The body is strong enough to keep the bloating contained. Therefore a person would never explode in space. People can’t freeze in space. Although space is extremely cold, in a vacuum heat transfer works very differently. Your body would maintain its heat and keep heating itself. In fact, you’d probably overheat before you froze. That said your blood will not boil in space. While space is cold enough for liquids to boil, lower pressure means a lower boiling point, your body’s liquids like blood have no direct exposure to space. So therefore your blood won’t boil. It’s protected by your skin and the rest of your body. People don’t run out of oxygen in space. Well they do, but that’s not what kills them. Actually if you were in a room with no oxygen source, you would die from the excess of carbon dioxide that you exhaled. Since blood rich in CO2 is poisonous to us that is what would kill someone, not the lack of oxygen. Nope no sound. Sound needs something to compress or vibrate against in order create waves which is what we hear. In space there’s no air. Yep, it’s still a vacuum. So there’s nothing for the vibrations to compress against. Which means space is a sad and quiet place. And if you could have awesome space explosions (which you can’t see #4), you wouldn’t be able to hear them. So really what’s the point? I know they’re cool! They don’t call it rocket science for nothing. Okay, sorry, I couldn’t resist. But in all honesty you can’t just push a button on a spaceship and suddenly conjure gravity like magic. The way to create gravity in space is to create force that will push objects in a certain direction. On Earth that direction is toward the floor or the ground. On a space ship, that’s a little harder to simulate. You have to do it using rotation. If you spin a bucket of water in a circle upside down at the right speed, the water will be pressed against bucket and won’t spill regardless of whether the bucket is right side up or upside down. Using this same theory, you can spin a space craft at the right speed such that the people and the objects inside are pressed against the outer walls of the craft. This creates a gravitational environment. That said, regardless of which route you go, it’s an expensive endeavor. Making something that large spin is difficult. There are a lot of logistics that go into how you get something to spin at the right speed. Too slow and you don’t get enough gravity. Too fast and you make people sick. And who wants puke on a perfectly good spaceship? I know I don’t! It’s not really on fire, but it is really warm. Okay, fine… it’s blazing hot! But it can also be quite dangerous in space. Radiation is a real concern. On Earth the atmosphere helps protect people from the suns radiation to some extent. However, in space there is no atmosphere so space travelers are at a much higher risk of receiving higher doses of radiation. Protecting against radiation, especially large galactic cosmic radiation events, requires quite a bit of shielding. Radiation shielding can be one of the heavier parts of spacecraft. So think about that the next time you want to have a solar flare wash across your fictional spaceship. Not enough shielding and you could wipe out your crew. I know it has the word year in it, but a light year, is actually a measurement of distance used by astronomers to try and reduce the use of large numbers in their calculations. One light year is about 5.9 x 10^12 ft, which is a 59 followed by eleven zeroes. A HUGE number. The Sun is 92,960, 000 miles from the Earth or 0.0000158 light years. Well that’s not sure a pretty number either, but when you start talking about other star systems that are tens of hundreds or even thousands of light years away, then things look a little cleaner when you can say something is 100 light years away. 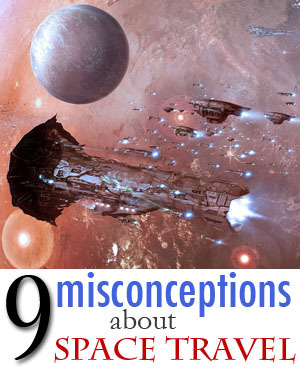 And there you have it, nine misconceptions about space. This is by no means an exhaustive list of things people get wrong about space travel, but hopefully it helps put things in perspective. After all, they wouldn’t call it rocket science if it was easy. Heck, I have critique partners who ask me about crazy space scenarios all the time. And now you can too. Seriously feel free. Message me on twitter or on my blog. I’m always happy to analyze minor plot details, or major ones. A huge thank you to Dan for letting me take over his blog! I now return you to your regularly scheduled programming. Click to Tweet this Article! Great list, though for number four what about plasma and radioactive explosions? Surely a reactor going pop will produce a pretty explosion, and plasma can burn/consume material in a vacuum. So with number four I should have been a bit more specific. Stuff doesn’t blow up like it does in the movies. In most cases when something “explodes” in space you can’t even see the brief fireball because its moving faster than the speed of sound and/or is outside the visual spectrum of light. In most cases you would just see flying debris. Great post, I found point 5 particularly interesting. I always thought people would die because of the lack of oxygen, not the CO2 content of the blood. thanks. yes I found that surprising too. Although when exposed to space without a suit, CO2 poisoning would take longer than some other things that would kill you first. Apollo 13 was damaged by an explosion in it’s own oxygen tank. Ordinary explosives don’t need air. They are made up of a combination of fuel & oxidant. Nuclear reactors don’t really explode. The worse thing that can happen is that the coolant water get’s trapped so that there’s a steam explosion. If nuclear reactors ever get sent to space, they may not send ones that use water as a coolant. Nuclear bombs work just fine in space, but the effects are different because of the lack of air. Objects can travel in space at speeds much higher (relative to each other) than are common on Earth because of the lack of air to slow them down. When 2 objects hit each other, the impact can look very much like an explosion. So, things cannot explode in space. My knowledge in Science is basic but a space ship would ideally have oxygen in it, if one were to shoot a torpedo at a ship, wouldn’t the fire have the temporary fuel? I have another question. I was reading the article on Space travel and this article on Artificial Gravity, and how long it takes. Putting Psychology into play: is it possible for someone to have a phobia of anti-gravity? I can understand why you would interpret Krakover as saying that nothing explodes in space but that’s not what he’s getting at. 1) Torpedoes go in the water. Missiles fly through the air and in space. 2) If something has an explosive inside of it, 99%+ of the time it doesn’t matter what’s outside of it. It can be ordinary air or pure nitrogen or empty space. 3) If the atmosphere inside of a spacecraft, even if it was pure oxygen, were to escape into space, then it would just dissipate. There’s be no explosion. That’s what Krakover was getting at. 4) An explosion inside of a spacecraft that gets out will have less effect on things outside than a similar explosion in an airplane similar to the spacecraft. 5) An explosion outside of a spacecraft will have less effect on it than a similar explosion would have on an airplane similar to the spacecraft.